We packed up and hit the rails, heading to Wales and Festival no. 6. We got to Euston station early because we hadn’t picked up our special Festival No. 6 train tickets yet. Thankfully, our friend J. spent half the day yesterday tracking them down because the Festival is hugely disorganized. They said they’d mail the tickets, and didn’t. They said they’d email them, and didn’t. Blah dee blah. We were getting worried. J. finally found the tickets at the First Class Virgin lounge at the station. The agents there thought the big, wrapped up stack of tickets was for a tour group. J. got her to open them and low and behold, our tickets! We got a good breakfast in front of the station and I picked up some supplies–cookies and booze–and then got in the long line for the train once the platform was announced. Argh…total confusion. The reserved seat info didn’t get uploaded so the screens all said “available” even though all the tickets had seat numbers, so all the festival people had to ask the people already in our seats to move. Most people on the train had huge packs (camping gear) and went back and forth banging tents and pads and sleeping bags into everyone as they tried to find a place to stow them. The small luggage racks were already full and our suitcases didn’t fit in the racks above. I moved a case of Strongbow and crammed my suitcase into the rack but poor R. had to leave his in the vestibule and jump up at every stop to make sure it hadn’t rolled out the door. The cute young things began to put on their festival make up – glitter and bindis. Festival style here, at least at this festival, is a kind of hippy raver look, leaning more towards hippy. The car was quite raucous and the Virgin train staff gave up even trying to service us for the 3 hour trip. They’d hired a two-woman band to entertain us, but not given them any space, so they stood in the aisle, trying to play as people pushed past. I’m not sure when we crossed the “border” into Wales, but the landscape began to look very different as we got closer to Bangor. Tall, jagged mountain/hills, vibrant green hillsides, chest-high stone walls surrounding sheep pastures, sheep. I felt the “otherness” vibe I hoped to feel when we crossed into Scotland (but didn’t). The Festival people were supposed to give us our wrist bands (to get into the festival) while we were on the train, but didn’t get to our car until we were five minutes from Bangor. We managed to get ours but J. and D. didn’t; regardless, we didn’t get our bus passes and would have queue up for those once we got off. In another moment of unexpected luck, in addition to the two booths we were waiting to get to, the festival people started handing out wristbands and bus passes starting at the end of the line. And we were at the very end. What the heck!! When does that happen? We hopped right on the bus and soon after were on the road to the festival. The hour trip was mesmerizing. Not only because of the great scenery but also thanks two loud English women in their late 40’s behind me. We got close to the festival and I saw a narrow gauge steam train! I’d love to ride it but I don’t think there is time. The bus pulled into the festival and it was total confusion again. The bus driver gave no instruction. He stopped, everyone got off, staff pulled our luggage out from under the bus and threw it onto the ground, and D. and J. went to find general camping. R. and I tried to find someone who knew what was going on but everyone appeared to have just gotten on shift and had no clue. 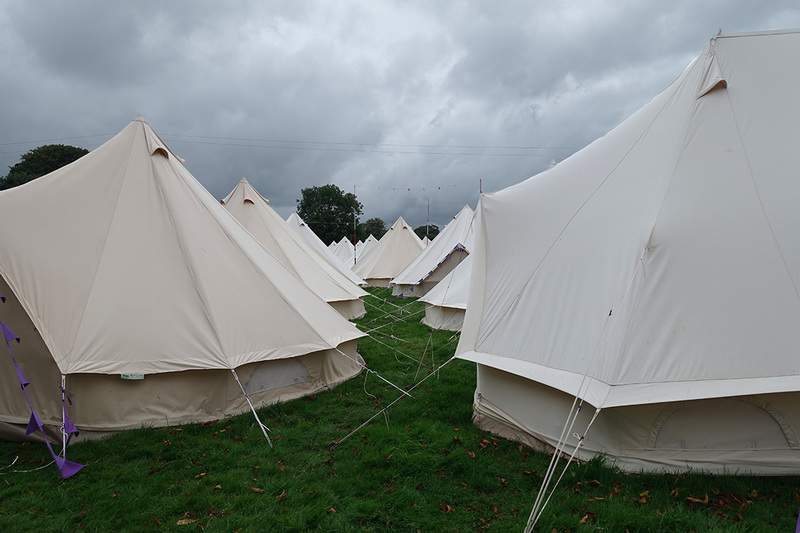 Eventually we figured out we had to get back on the bus to be driven to Boutique Village–the pre-set up tents we’d booked. Other people had to get off the bus because it wasn’t the bus to the parking lot. We waited in line, again, to get our camping wristbands and it started to rain. Our tent, one of many in identical rows, is pretty cool. My first Glamping experience. We’ve got a real mattress, a table, two chairs, a weakly-inflated and unusable couch, and two side tables. We can stand up! I’m a-ok with this although it is horribly overpriced. Oh and we’ve got private “fancy” toilets and showers! We stowed our gear and tried to text D. and J. to make plans for dinner and found…the internet doesn’t work. Cell doesn’t work. We had 3 bars of 3G but nothing happened. We had no idea where they were. By sheer chance we met D. in line at a food booth in a lawn area between the big arena and the village. 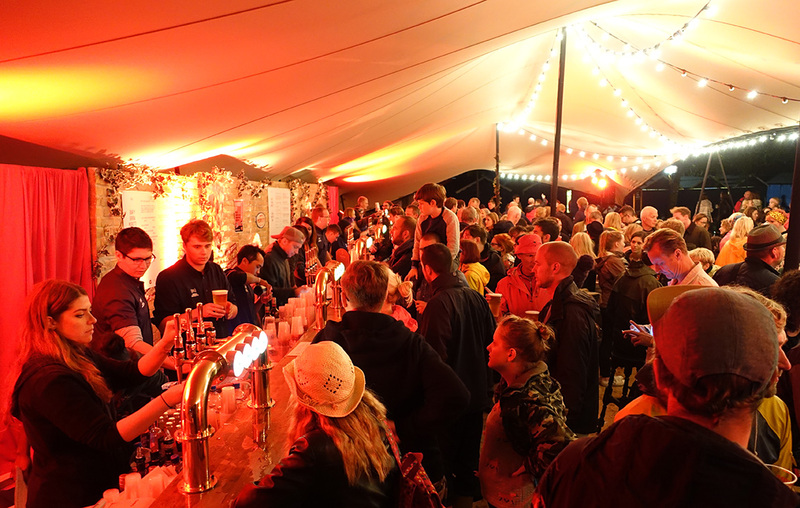 We joined he and J. and their friends from Edinburgh in what I called the red tent – a Moretti beer tent with red lights. We had a nice night! A. and S., J.’s friends from college in Edinburgh were fun and we had drinks and good conversation. This entry was posted on September 1, 2016 by roadtripz. It was filed under 2016 travel, Europe .